Here’s a quick and easy recipe made especially for the Christmas holiday! Using a standard mixer, mix butter and mascarpone cheese for 2 minutes or until light and creamy. Add the vanilla extract and pinch of salt to the mascarpone cheese. Dab a ring of vanilla buttercream on top of each brownie. Cut off the head of the strawberries so it is flat. Place it upside down on each brownie, pushing gently to secure in place. 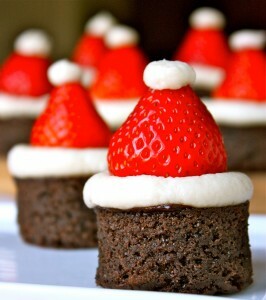 Top the tip of the strawberry with a dot of buttercream to finish the santa hat.